Posted October 2, 2018 by SCS Gearbox & filed under Mud Trucks. Driving through the mud in a mud truck is one of the most fun things you can do on four wheels. However, before you can do it, you need to either buy a mud truck that’s already been put together or, better yet, build your own mud truck from the ground up. If you’re going to build one for yourself, here are a few of the things you’ll need to prioritize while you’re doing it. Prepare your suspension for muddy (and bumpy!) conditions. As you might imagine, driving through ridiculous amounts of mud can really take a toll on a mud truck’s suspension. You’re going to be bouncing around all the time. Make sure you install a suspension that can stand up to mud bogs. Additionally, try to choose a suspension that won’t add much weight to your vehicle. A coil-spring suspension is usually the right choice. Invest in tires that are both big and wide. To work your way into and out of mud bogs successfully, you’ll need some very big and wide tires. Most mud truckers go with tires that are either 38 or 40 inches. They also keep the air pressure in the tires fairly low when they’re planning on driving them through mud bogs. This gives them better traction and helps drivers maneuver around in mud without a problem. Make your steering box as sturdy and stable as it can possibly be. To control the large tires that you put on a mud truck, you need to have a steering box that’s up for the challenge. A lot of people opt to go with a manual steering box as opposed to a power steering option because it’s usually a lighter choice. It’s also well equipped to keep up with the bigger tires on mud trucks. 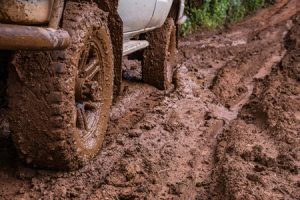 These are just a few of the aspects that you’ll need to keep in mind when you’re creating a mud truck. You’ll also need quick change transfer cases, countershaft transmissions, and more to bring your mud truck to life. Call SCS Gearbox at 419-483-7278 today to get your hands on the parts required to put a mud truck together.